The Seattle Aquarium is one of the most unique, full-service facilities in the Seattle area and a wonderful waterfront treasure. 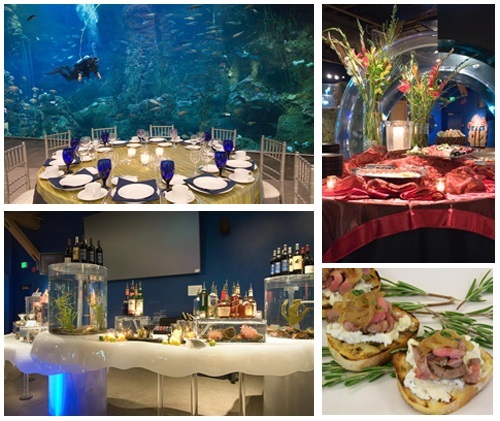 With the grandeur of the 20’ by 40’ Window on Washington Waters as your backdrop and a tantalizing dining experience to complement your surroundings, your evening at the Seattle Aquarium will fulfill your vision of the perfect special event. All of our events contribute to the Aquarium’s mission: Inspiring Conservation of Our Marine Environment. Party with the stars! Sea stars, that is. 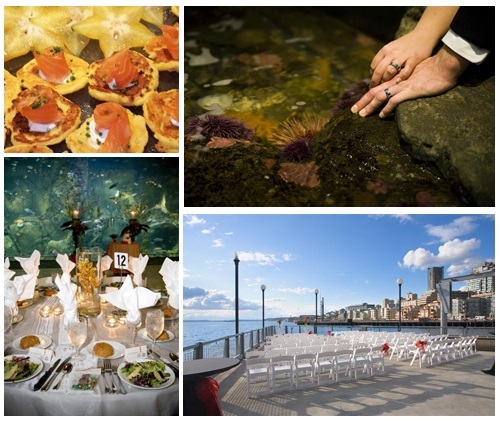 The Seattle Aquarium offers a magical venue that holds up to 800 people for any occasion, from weddings to corporate functions. Located on Pier 59 at the edge of Puget Sound's Elliott Bay, the Aquarium will offer your guests a chance to enjoy some of the most extraordinary spaces in Seattle. Entertain in the Ackerley Foundation Puget Sound Hall with the luminous Window on Washington Waters, complete with hundreds of fish—your personal interactive party decorations! Want your event to reflect your creative style? The Seattle Aquarium is prepared to meet your needs with sophisticated service and knowledgeable staff. Allow our on-site culinary and event planning experts to create an event that is entirely yours. Unique dining themes, uncompromising quality and outstanding service are the hallmarks of our success. *Please note: the Seattle Aquarium does not offer birthday parties at this time. Because your wedding is a once-in-a-lifetime experience, it requires special consideration and attention to detail. Our event planning professionals will work with you through the entire event process, from the initial planning session until the last traces of dessert disappear. Whether it's table settings, lighting, floral arrangements, room décor, entertainment or catering, our event planners will assist you every step of the way to ensure your event is flawless. Make the big moment even more magical—propose at the Seattle Aquarium! You and your intended will take center stage and become part of our noontime Window on Washington Waters diver show! Aquarium divers wearing specialized masks are able to talk back and forth with Aquarium interpreters on the outside of the exhibit and answer questions from the audience. Bearing a sign with your personalized message, our diver will start off your proposal with your words; then you go down on one knee and take it from there! Subject to availability; must have two-week advance notice. Includes Aquarium admission for up to four guests. Contact proposals@seattleaquarium.org to book or for more information.